Archive image featuring a zipper by Riri. 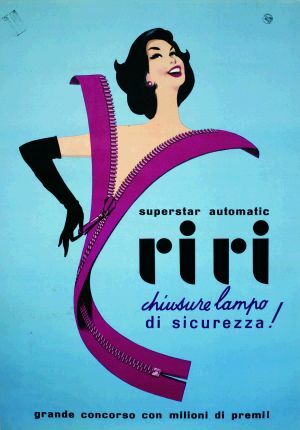 Starting from 9 June 2016 and for the upcoming months, Riri Group, established Swiss zipper manufacturer, will celebrate its 80th anniversary with a series of celebrations. The starting event will happen in Mendrisio, in the company’s headquarters, on 9 June 2016 during an event that will present industry insiders the company. Following events will happen within specialized trade shows and international appointments in the following months. Riri Group, worldwide specialized manufacturer of zippers and buttons, originates from Riri SA, parent company founded in 1936, main manufacturer of zippers with pre-cut metal teeth applied directly on the tape. Various innovations were launched through the decades such as, for instance, Aquazip, water-repellent zipper model that guarantees the highest level of performance in the most extreme situations. Riri Group was founded in 2006 as a merger of companies operating in the accessory sector after they acquired Italian button, snap and rivet manufacturer Cobrax, and Meras, Italian specialized zipper manufacturer. In 2014 Gilde Buy Out Partners (AKA Gilde), European investor involved in the DACH and Benelux markets, bought Riri Group. Riri Group’s product range is now involved in four macro areas of application: leather goods and accessories (40%); clothing (30%); jeans (18%); and outdoor and work wear (12%). For the future they will continue focusing on constant innovation of small details that enhance and complete top fashion, sportswear and accessory brands.